This one is in such a high traffic area, I’m surprised nobody has noticed it before. It’s not the worst one out there, but it’s enough to give you a pinch flat. Sennott at Bouquet, Oakland. If you make the left off of Bouquet onto Sennott, this is just as you are completing the turn, and the slots are almost perfectly aligned for that. Lovely! Thanks for posting them. I’ll try to get someone on them. Ross Park Mall is not an area where one would bicycle that often, but on a trip around the mall today, I found this lovely example. Two photos: The first shows how wide the gaps are. The second (I hope) shows that it is right in the path of travel. Where it is: If the mall was a clock face from the air, and the walkway from the PAT bus stop is at 6 o’clock, this is at 7 o’clock. I circled the mall. 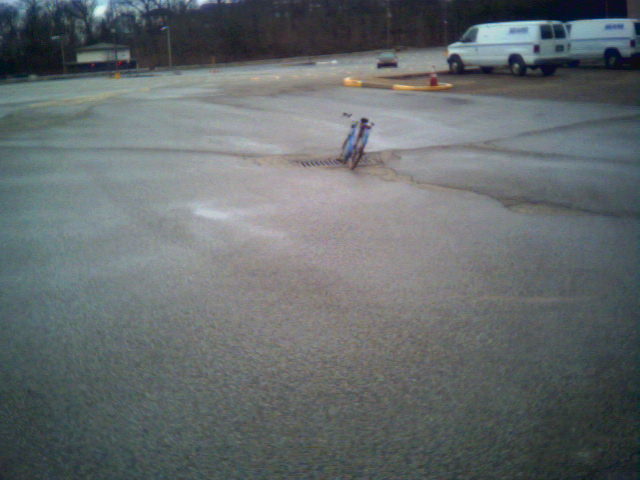 This was the only one I saw, but I wasn’t looking for these, but rather bike racks. Note the mall security truck chilling in the background in the top picture. They didn’t say a word to me, even though the bike was in the slot fully five minutes while I took and uploaded the two pictures. 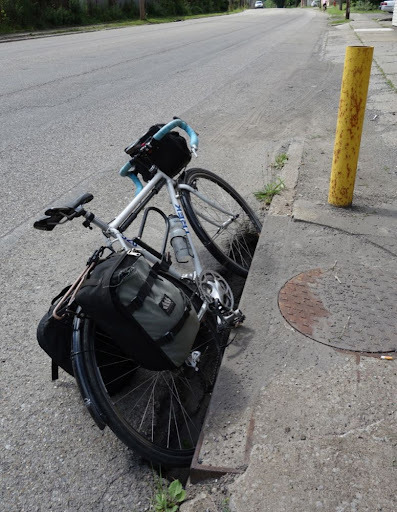 Don’t have a picture, but I noticed a really obnoxiously stupid one this weekend: Where the Strip District trail meets the stub of 21st St, there is a diagonal slots grate like the one Stu posted Mar 3 2013, perfectly positioned for a rider making a turn from trail to 21st (or vice versa) to line themselves up and drop in. Ramblings at 2:03 a.m.: Now that we have five pages of these, some of them going back five years (and most of them still there), we need better tools to keep track of them. I need to make a map of these. Whatever we use for a marker for each one needs to be able to show a status (fixed, not fixed). Maybe also a spreadsheet, too, like we use for the Tag-o-Rama games. I’ve also thought about placing some valuation on the amount of danger. That since-fixed monster on Babcock by Northway Mall that inspired this thread is representative of the worst type, and while there are others of the same type in existence, not all are poorly placed. Others may not be able to eat a whole tire but have enough of a depression that they could send you flying or break a wheel. My whole point in starting this thread was to identify the things that make it unsafe to ride a bike, so that they would be fixed, thus removing valid objections to riding a bike in traffic. I have a spreadsheet. Not tracking results though. Have photos embedded in spreadsheet. Will continue to remind responsible parties of their need to get after these. West Homestead, 600 block of West 7th Avenue, westbound/downstream. Another one of these edge cases where your chances of hitting it straight on are slim, but you could catch those outer two slots pretty easily if you were either hugging the curb, or a kid riding the sidewalk. 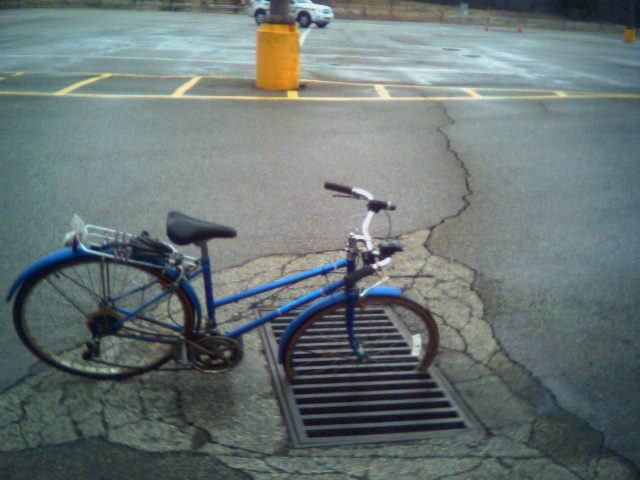 Dang, there are still about 4 really bad recessed grates on railroad street right in front of the police parking lot. Always have to keep a look out here, they are really hard to see at night. The point I tried to get across is that it’s both a jurisdictional issue and one of follow-up. On the latter, even when problems are properly reported, years go by and the problems do not get fixed. On the former, I pointed out that as I ride along and find them, I cannot know and do not care whose road or drain grate it is to fix, not with 132 municipalities, the county and the state owning various roads, plus those on private property. From my perspective, they are all one and the same, and a hindrance to safe cycling. Sitting next to me was an elected official from Swissvale. He said that even if every one of these was known, there is not money in the budget to replace them. $1,000 may not sound like a lot of dough, but they can’t even get the roads paved, let alone take on projects such as these. Multiply that by one-hundred-some other tiny towns, and you get an unfixable mess. June 14, 2013, 3:35 p.m. Thank you for submitting to 311. Your request has been sent to PWSA to evaluate and replace the cover. Your request number is 335374. Next to the Crafton Library and municipal building. On River Ave where it meets the 31st St Bridge (near Route 28). 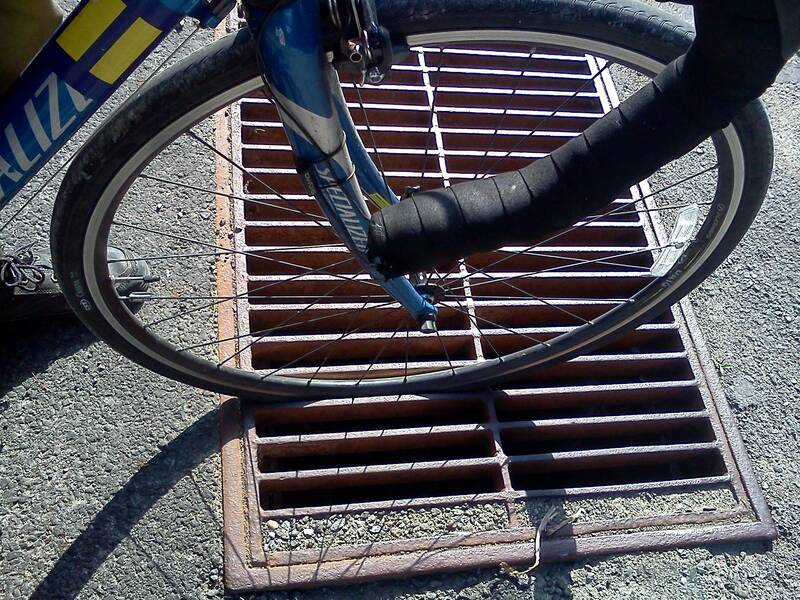 Even my wide 38mm tire was easily eaten by this dangerous drain grate. 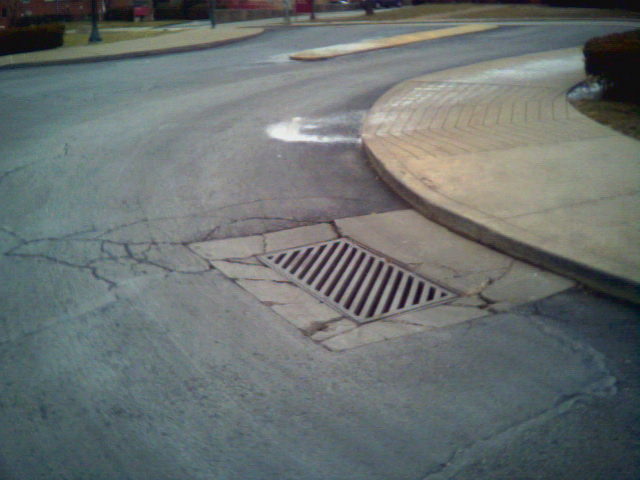 This drain grate appears to be newly-installed. Benton at Bascom, in the NW corner of the city. This is on a sharp right turn, from Benton onto Bascom, and the slots line up almost perfectly for a bicycle making the turn. 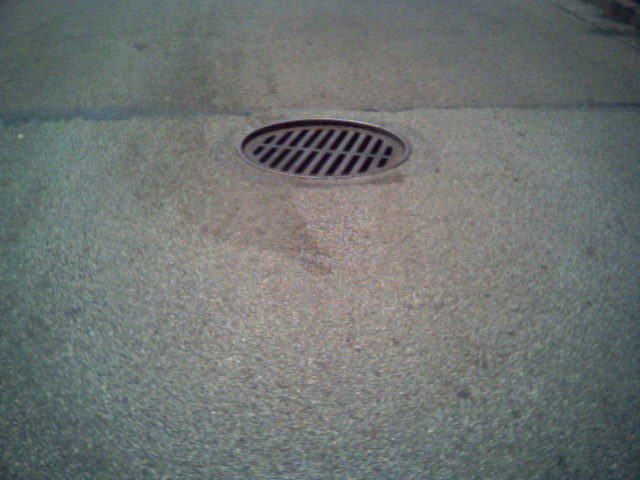 As it happens, the grate is also full of silt, so you will not drop in very far, but it will still mess with your steering. Has anyone reported the two on Penn Ave downtown in between 6th and Stanwix? I don’t ride there often but I was eaten yesterday. Cherry Way (Wm Penn Way) between Forbes and Fourth Aves. In this case, the slots are barely tolerable, but the sight of approaching this, and not realizing you probably won’t get thrown, can cause you to swerve out in front of traffic. There is no parking along this curb. Note that this photo is looking upstream; traffic is one-way coming at you here. Despite that, it is quite common for a cyclist to be riding along the left curb, since a left onto Forbes is not legal, so a left onto one-way Fourth to get to Grant Street is quite likely. In front of 3445 Babcock Blvd in Ross. This has been here all along, and while I’ve ridden past it 250 times and thought it far enough out of the way not to be a problem, today I got a little too close to it. 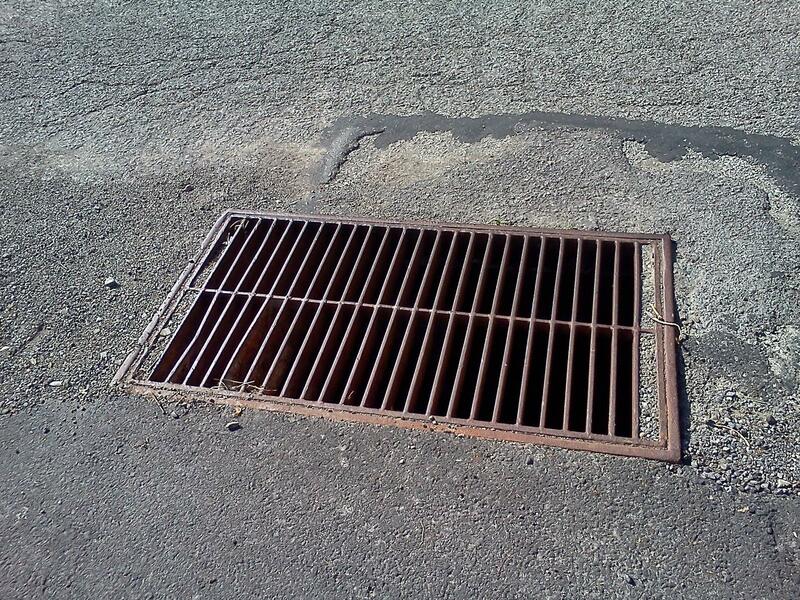 Picture is posed, but still, it’s the worst kind of grate, and not impossible to nail straight on. Clearly labeled “Allegheny County”. It’s only a couple hundred yards from the one on page 1, at 3365 Babcock, and less than a quarter mile from the similar one at 3333 Babcock. @paulheckbert Seeing your photo of the scupper by the 31st Street Bridge reminds me that a longitudinal slot just a couple of feet from there managed to catch me and put me off balance a few days ago. Technically it’s on River Ave, at the junction to the 30th St Bridge (that takes you down onto Herr’s Landing). Not exactly a drain grate, more a junction in the pavement, but it’s several feet long and wide enough to catch me and mess with my steering. This one is a bit out of our immediate area — Jeannette, Westmoreland County — but there’s a story behind it. Year: 1986. I was living in New Stanton. One day, there was a story in the paper about a teenage girl who got killed in a bicycle wreck, no car involved. I remember driving around Jeannette, trying to reconstruct what happened to her. I had the street — Margaret Street, just off PA130 — but driving around, I couldn’t see what could have caused her to get killed. It’s a back alley on a mild grade. They said she lost her brakes, but that didn’t really explain it. Today, I was on the motorcycle, and now I can see it. She must have dropped into the slots and went over the handlebars, snapping her neck. If she managed to hang onto the handgrips in going over, the bike may well have pulled back out of the slots, and nobody figured out what happened. That’s so sad, Stu! I wonder if her parents are still trying to figure this out? Here’s one we noticed riding back from exploring the southern arms of the Montour Trail with @fultonco et al. 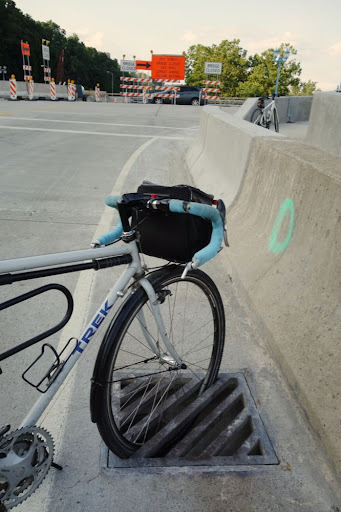 Saturday: at the top of the new segment, there’s this grating on Triphammer Road. Probably not enough to eat a person, but could ruin someone’s day. I forgot to get a long view of it, but the grating is clearly visible on the satellite image of the intersection as well as on streetview. Good news: The grate on 4th Ave by the entrance to the new bike lockup has been replaced. Subtitle this one “Why kids in Ingomar don’t ride bikes.” Woodland at McCutcheon, 0.1 mile from the Ingomar at Harmony grate mentioned on the first page of this thread. This is on a quiet residential street in Ingomar, NW corner of McCandless Twp. You can see that a cyclist hugging the shoulder, going straight ahead, might well drop into this. This wouldn’t be your lycra-clad road warrior flying along at 22 mph. Instead, this would be your 8-year-old kid trying to make a solo trip a quarter mile down a traffic-free street to visit a friend. Kids who don’t bike become adults who don’t bike. In contrast, the grate on the other side of the intersection is a perfectly safe design. Oh, found one on the panera bread ride on saturday…. Corner of chesbro and river ave, could be really bad if you’re turning from river on to chesbro or coming off the trail to connect to the 16th st bridge. Iona at Diana, Spring Hill. Edit: In my browser (Chrome), just looking at the page, the pic is sideways. I click on the picture, it’s right side up. I don’t know if this is a browser thing, a rendering thing, an iPhone thing, or merely a PEBCAK issue. StuInMcCandless wrote:Edit: In my browser (Chrome), just looking at the page, the pic is sideways. I click on the picture, it’s right side up. I don’t know if this is a browser thing, a rendering thing, an iPhone thing, or merely a PEBCAK issue. PS I don’t use Chrome. It’s possible that Chrome has a configuration option how to treat this kind of pictures. Another one from my trip through Spring Hill a couple nights ago. Corner of Matthias and Lappe Lane. Again, not the worst offender, but the slots are aligned with the turn, so especially in the dark or dim light, you might not see this and drop right in. @stu: regardless of what browser (in fairness I haven’t tried Chrome) or OS I use, your photos are sideways and remain that way after I click them. Are you uploading directly from your phone or from a PC or some other device? On my phone (Android), I can hit the menu key while looking at a photo and there is an option to rotate it. I believe the iPhone should have the same feature, and I know you can do that on a PC easily using the stock image viewer in most operating systems. Here’s a possibility: when you hold your phone to take a landscape-style photo, which way do you rotate it? I know on some older phones, if you hold it upright (as you would to talk on it) you can rotate it 90 degrees anticlockwise and it will switch to landscape mode automatically, and the photo will look normal. However, if you rotate the phone 90 degrees the other way, the picture appears sideways by default. Are you by chance left handed? * Chrome: Photo in post sideways, normal when clicked. * Firefox: Photo in post sideways, sideways when clicked. * IE 9: Photo in post sideways, sideways when clicked. * Safari 6: Photo in post sideways, sideways when clicked. I don’t remember which way I had the camera positioned when I took the shot. The iPhone seems to be able to figure out which way I am holding the phone and puts the sky on top, so I don’t know why, if this info is somehow embedded in the image, that a browser cannot do it. No, I am not left-handed. I’d just like to be able to rotate the image after uploading. chrome is probably reading the exif orientation tag. Down in McKees Rocks Bottoms, on the side of the tracks farther from the river, we have this one. Leonard St at McKee St, right in line with the path of travel as a rider would turn right from McKee onto Leonard. After noticing the one grate on Saturday in the prior post, I took a bike ride down into The Bottoms on Sunday. There must be 10 troublesome grates at various points, and of every type. Too many to post the photographs here! It’s a shame, really, as the area is otherwise ideal for cycling: little traffic, low traffic speeds, dead level, very residential. The wavy brick streets might pose a challenge, particularly at night, but grates await any kid who flies off a curb or turns a corner. Needless to say, on a beautiful Sunday afternoon, I hardly saw another bicycle in the area despite riding around for a half hour. The woman hit a recessed manhole cover and was thrown off her bike. She sued the city and they settled even though the woman was not using a light after dark nor wearing a helmet. We should contact her lawyer! I’m wondering if the reason the city settled was because they knew about the manhole cover, but didn’t do anything about it. There are legal consequences for being able to prove that the city was informed of a danger but did nothing to fix it. I read somewhere there are people who work for lawyers in NYC who document every sidewalk fault, so the lawyers can sue if someone is injured. Which brings me to my question — are we informing the appropriate municipality of the existence of the dangerous longitudinal storm grates? It might make a difference to someone. Jonaweb, I can take that question. Yes, I compile a list with all relevant details, photos, etc., and distribute it to the “owner” of the roadway (usually, City, County or PennDOT). I also share the information when a project is funded, or proposed for funding, to encourage active remediation of such issues. Long slow process, but we do see some action. Sure wish it could be more, and faster, but the wheels of bureaucracy move slowly! Maybe I should go back to the Bottoms with camera and clipboard and mark them all down. Another spot I’m told is bad is Swissvale, but I never get over that way. Maybe this is a group project for 2014: Document ALL the bad grates, even the ones on private property (Eat ‘n Park, CMU, NHills Village, etc. ), where a cyclist can legally be expected to be. If I recall that discussion with USDOT back in May, I got the impression that while these may all be the responsibility of various boros, etc., the fact that it is so pervasive makes it a group thing, and so dropping $1 million to replace them all begins to sound like a blanket project. So let me throw it out there: Do we have 500? Figure on $2,000 apiece for parts and labor (thumbnail guess), that’s a cool million. Maybe where I should start is here, but I might need some help in putting it all together.